Launched in March 2013, the new superyacht Ocean Paradise will make her public debut at the upcoming Monaco Yacht Show in September. Ocean Paradise is a 55 metre full-custom superyacht built in steel and aluminium. 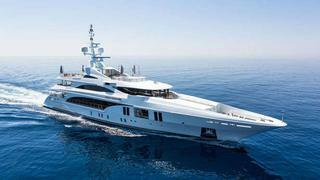 Designed by the Benetti in-house team, she’s characterised by very large openings, especially on the main deck. The spacious and bright interior, created by designer Mauro Izzo, boasts an interior where Zen gardens stylishly mix with carbon-fibre. She accommodates 12 guests in six cabins, including a full-beam master suite on the main deck with a private balcony. Ocean Paradise is powered by twin 1,765kW Caterpillar engines giving a top speed of 17 knots and a cruising speed of 15.5 knots. Special features include a panoramic sundeck with an oversized pool, indoor/outdoor gym, dance floor and exterior TV built in to the bar. The transom reveals 25sqm dedicated to a beach club (tenders and toys being stored in a side garage and on the foredeck).